London West, UK - Open plan designs have truly made a kitchen space the heart of a home. It can even dictate the atmosphere of the whole house. So a kitchen design choice has becomes even more important and Interiorzine blog has the latest inspirational tips to reclaim your kitchen living space. One current trend is to use natural earthy shades and textures. These inspire the use of reclaimed wood, stone and metal. All these work well as work tops, cupboards, shelves, walls and flooring. Enjoy the introduction of different shapes, patterns and crafted elements to bring extra style in designs. Dark colours are contrasted with brights. Vintage and antique pieces can add old fashioned charm or memories of childhood and a no pressure lifestyle. Reclaimed designs are also seen as the right choice for the planet. 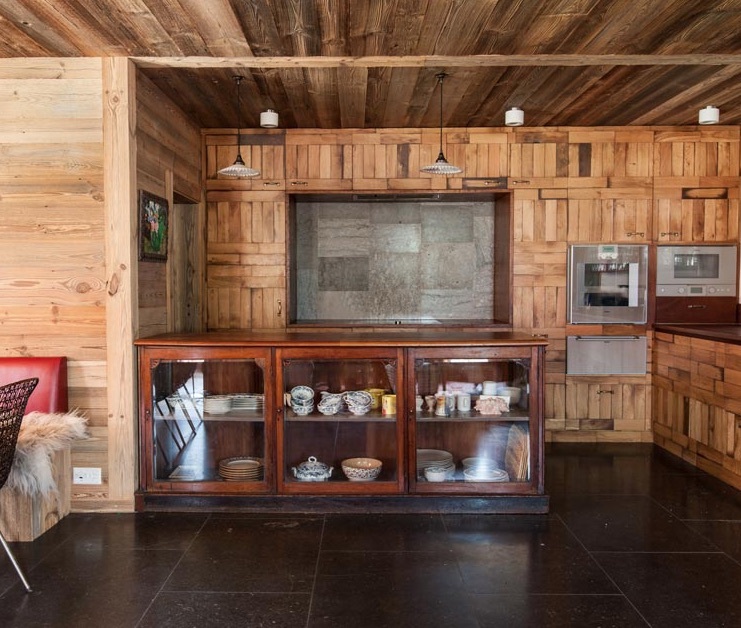 Reclaimed wood used in a living space is shown in the images of a chalet kitchen design from Retrouvius. Plus a reclaimed solid wood Iroko counter cupboard suitable for reuse as a kitchen island currently for sale from Norfolk Antique & Reclamation. Reclaimed Iroko wood for worktops is also for sale on SalvoWEB from Salvo Code members Architectural Forum and V&V Reclamation. Also find a unique sixteen foot reclaimed teak table supported on six turned Portland stone balusters from UK Architectural Heritage. Industrial and urban rustic are hot trends. Customize the design idea to suit your individual needs and tastes. Decide your preferred style and either keep it simple and uncluttered with things out of sight or add charm and interest with items on display with open shelves or glass cupboards. 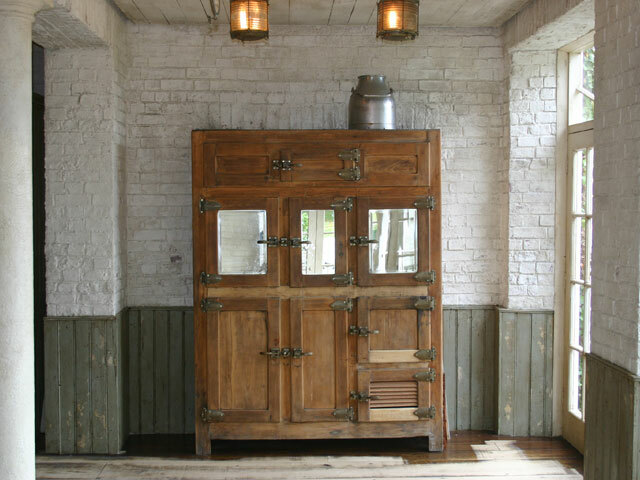 Select reclaimed and antique pieces to bring character such as Belfast or stone sinks combined with original brass taps or a unique statement pieces like an antique fire surround or range. Another stand out feature is a vintage wooden fridge. The image shown is from the Vintage Fridge Company, see their website link on Salvo US. Salvaged lighting with metal or glass shades completes an industrial rustic theme. Currently for sale from Edward Haes on SalvoWEB is a chandelier with solid brass fittings. Reclaimed from an English church c.1900. it has been cleaned, polished and waxed retaining the original black paint. Rewired and earthed. Ready to make a perfect statement piece in any open plan living area. Finish with vintage or antique accessories such as rugs, patterned tiles or bygones such as old enamel advertising signs. These introduce colour and character. Find a selection for sale on SalvoWEB. Bring extra colour with plant life. These too can be displayed in vintage jars, jugs or pots for added character. Plus do not forget to add comfy and warm places to sit and eat, relax, work or play. 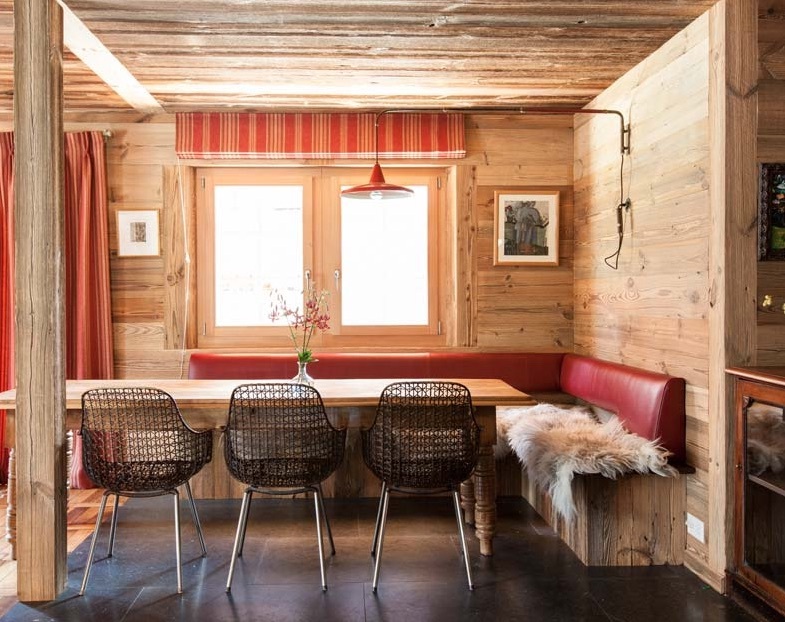 The image shows the lovely idea of adding extra warmth and softness from sheepskin rugs on the bench seats in the chalet design from Retrouvius. This is the time and space to reclaim family life, friendships or just some well earned chill out time. 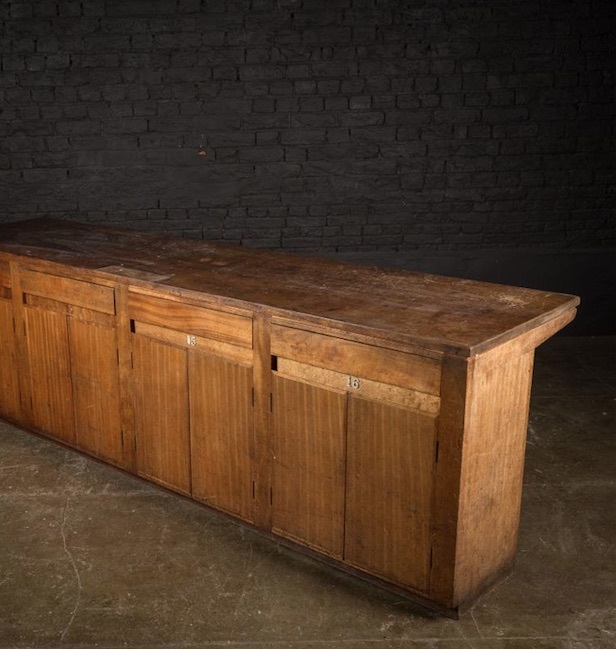 Find antique and reclaimed wood, stone, lighting, sinks, industrial, furniture and bygones from the SalvoWEB online marketplace where you will also find a directory of salvage and antique showrooms. Decoist gives twenty ways to use reclaimed wood in your kitchen design and Interiorzine blog sums up the latest kitchen trends. See the links below.